Do you ever read a book that you adore, and you instantly declare the author your favourite? Obviously, ignoring the fact that he/she has 30 more books you have not read yet? The story of my life! I go on an on about my undying love for Adam Silvera or Patrick Ness...based on 10% of their works. Too many books, too little time, I suppose. 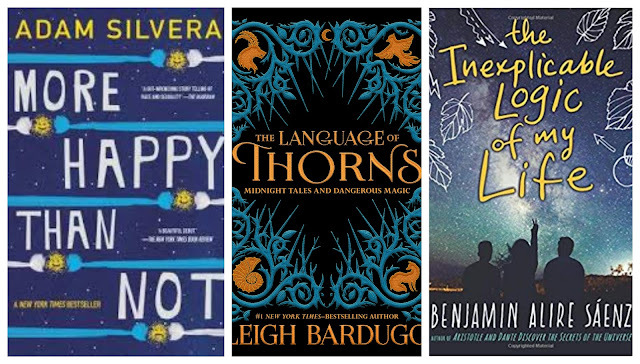 So today`s post is a great reminder that I have a ridiculously long TBR, but I should at least get to these books. The plot of this novel reminds me so much of "Eternal Sunshine of the Spotless Mind", which is one of my all-time favourite movies. Plus, it`s Adam Silvera, and his writing is so beautiful and heartbreaking. I`m 99% sure it will make me cry, which is why I`ve been staying away from this book. But I`ll definitely get to it before the year ends. I love dystopia, and I love Ness, so it`s a simple equation. Ideally, I would have liked to read this trilogy before the movie comes out, but that`s not going to happen. So I`ll probably do that terrible thing when you watch the movie before reading the book. Shame, I know. But although I love the author, dystopia has been a hit and miss lately, so I want to know if it`s worth the time. Dostoyevsky is my favourite author, and I`ve lost count of how many times I read "The Idiot" and "Crime and Punishment". I`ll probably reread "The Brothers Karamazov" soon, but before I do that, I`d like to finish the only book I have not read by Dostoyevsky. It`s a book I`ve been pushing aside for years, though I can`t tell you the reasons why. The Grishaverse is my favourite Universe, and I adore Leigh Bardugo with all my heart. I also like fairy tales, and I was tempted to start this book so many times. But I was never in the right mindset for it. I`ll probably pick it up around the holidays, as it looks like the perfect book to snuggle with on a cold winter night. I`ve only read "Blindness" and "Seeing" from Saramago, but both made an everlasting impression. The author has a unique way of capturing the human essence, and his writing is exquisite. This book is on my #acrosstheworld TBR, and I`m hoping to get to it this Winter. "Aristotle and Dante Discover The Secrets of the Universe" is an amazing YA contemporary, and it made me fall in love with Saenz`s writing. His style is so lyrical and meaningful. However, some reviewers thought that aspects of this book are problematic, and that put me off. Obviously, we`re all entitled to different opinions. But I`m just scared I won`t find this book as magical as Ari and Dante. Whilst I`m a big fan of his fiction work, I`m not that familiar with Orwell`s nonfiction books. Although I did learn a bit about the Spanish Civil War in school, it`s not a subject I excel at. So hopefully, this book will give me a better understanding of those events, and some insight into who George Orwell was as a person, not just a writer. "The Book Thief" is one of the best historical fiction books out there, and it made Zusak a world-acclaimed author. Interesting enough, I don`t hear much about this book. Is it because it`s bad or just because "The Book Thief" gets all the glory? It`s something I want to find out soon. The roaring 20s are my favourite decade, and Fitzgerald is a master at immortalizing what that period felt like. I loved reading "The Great Gatsby" and "Tender Is The Night", and whilst I`m not familiar with his short stories, I think they`ll be just as good. If there`s one author that never disappoints me, it`s Haruki Murakami. I`ve loved every book I read by him, and they`re all so unique and fascinating. But because I`m lazy, I have not read this huge trilogy. I mean, 925 pages for three books is decent. But when you cram them into one volume, it can get a bit intimidating. Let me know if you`ve read any of these books, I`d love to hear your thoughts. Or if you love other books by these authors, feel free to leave some recommendations. I enjoy Zusak`s writing, so although I have a feeling it won`t be that emotional, I`m sure I`ll like "I am the Messenger". I finally read some of Leigh Bardugo's work! I finished Six of Crows recently and immediately started Crooked Kingdom. Here is my Top Ten Tuesday. The Sic of Crows duology is amazing! Hope you enjoy Crooked Kingdom. I don't think I've ever read Dostoyevski. I'm learning Russian, so I probably should read something of his someday. I also want to read Leigh Bardugo someday too. Both authors, although with different styles and genres, they`re amazing. Highly recommend them. I read The Language of Thorns earlier this year and really enjoyed it, I hope you do too. I think it will be the perfect Christmas read, have high hopes for it.